House with patios, garden and fantastic views. Casa Clara has absolutely stunning panoramic views of the historic white village of Vejer. These can be enjoyed from the patio and roof terrace or the large open plan living room. The equestrian centre, country club and golf course of Montenmedio, are nearby. It is the home of the world famous Sunshine Tour held every year in February and March. Either the spacious living room or the patio in front are ideal places to sit and relax or lounge in the sun. This well designed house has a few unusual features including the fireplace, and the bath built with mosaic tiles. The living room/kitchen is over 40m2 and from here you walk up 3 steps in this split-level house to the bathroom and bedroom. The fully fitted kitchen has stone worktops, microwave, hob, oven, fridge, kettle and dishwasher. There is a small washroom with washing machine a few metres walk away. 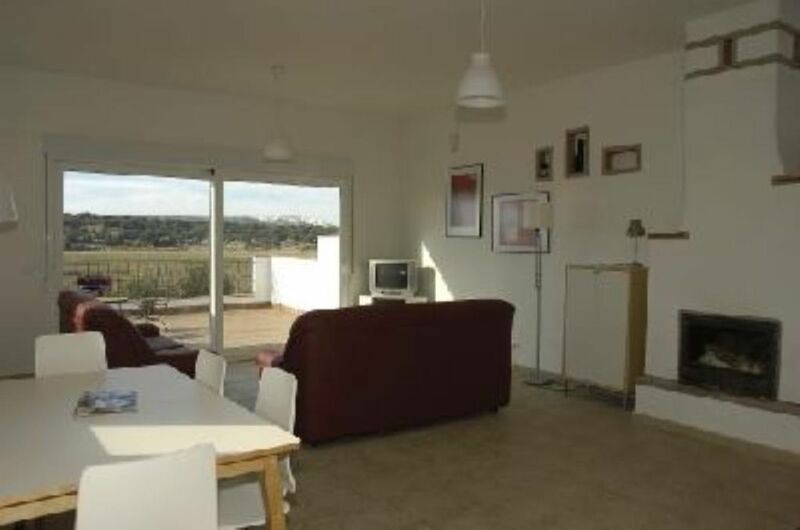 The total living space of the property is approx 65m² and the front patio is 25 m2. The roof terrace is 65m² as well. Casa Clara was completed in 2007 and sleeps up to 4 people, 2 in the bedroom and the other two on either of the bed settees in the living room. There is a TV, dvd and video with a selection of tapes and English satellite tv. The house has parking and the use of a garden of approximately 150m² which has several orange trees and a grapevine. We also run the English bookshop in Vejer with over 3000 second hand books, so you may choose some of these books free of charge to read during your stay. "Everything was great! The house is really very charming, everything you need is there, the living room has a perfect panorama through big windows, it was so nice to view sunset over Vejer de la Frontera each evening! The owners are so nice and friendly, they helped us in every small question we had during our stay! Dear Clara and Keith, thank you once again for your hospitality! Of course, it''s very desirable to have a car if you decide to stay at this house. We hope very much that one day we will come back!!!!" "Nice place to stay, in winter a good fire place, sunny terrace, with good privacy. Beautifull view on Vejer, very friendly and helpfull landlord and his wife. Bellissimo appartamento dotato di tutti i comfort necessari per una vacanza al mare. Posizione strategica per andare ovunque, proprietari Keith & Claire che sembrano John Lennon e Yoko Ono, super gentili e assolutamente non invadenti (eppure è casa loro). Terrazza al piano strepitosa, terrazza al primo piano da leggenda. Mai sentito il bisogno di accendere la Tv, basta affacciarsi alla vetrata o uscire al tramonto godendosi i colori dell'Andalusia in compagnia di una fresca Cerveza. Spero di tornarci un giorno. Visra bellissima su Vejer, casa in posizione molto comoda per visitare le spiagge e i bellissimi paesi della costa della Lux. Keith e Clara, i proprietari, sono molto gentili! We chose this holiday home because we wanted an affordable, quiet, beautiful place to stay within driving distance to the beach. The house had everything we needed, it's the perfect size for a couple. We cooked our own meals all week and the kitchen served us well. The views are stunning, the terrace is lovely for meal outside including BBQ. The setting is very peaceful and remote. We absolutely loved being able to pick oranges from the trees in the garden and make our own juice every morning! Keith was very friendly and helpful with any questions we had, but wasn't intrusive at all. We recommend hiring a car if you stay here. Turn off the Motorway, N340 at km 41 for El Soto,follow the road for 500 metres and turn left. Follow this road through the village for around 1 km. Casa clara is on the right hand side with green gates at number 61. The UNESCO hilltop village of Vejer De La Frontera is only 7 kms away by road, and the nearest beach is in Barbate, which is 15 kms away. Jan Morris described Vejer as "Perhaps the most spectacular of all Andalucia's white villages" and it seems a fair description of the hilltop village. The town was relatively undiscovered by foreigners until around five years ago and even today is relatively low key, especially compared to the tourist overload of the Costa del Sol. Here on the Costa De La Luz, things are a bit more laid back and the whole coast is almost one long stretch of glorious Atlantic beaches. Nearby beach resorts are Conil, El Palmar, Los Canos De Meca, Barbate, and Zahara de los Atunes. The lighthouse at Cape Trafalgar, scene of the famous battle is nearby. The whole area is steeped in history, everywhere you look there are reminders of Spain's Moorish past, and you don't have to look too far to see relics of Roman and pre historic Spain. Cadiz(Gades) is the oldest town in Europe, was settled by the Phoenecians around 5,000 years ago, whilst the Cave art at nearby Benalup Sidonia is thought to be over 30,000 years old. It was here in Cadiz, that Drake "singed the king of Spain's beard" and his attack on the harbour in 1587 postponed the invasion of the Armada for another year. Cadiz is a historic city with a lovely old town and probably the biggest carnival in Europe, it is the same time of year as the Rio carnival, lasts for ten days and sees people out celebrating all night in fancy dress. It is important that you understand that Casa Clara DOES NOT HAVE TV CHANNELS. We have a tv and a small amount of dvds. Also, we do not have air conditioning, but we do have fans. Es importante que comprenda que Casa Clara NO TIENE CANALES DE TV. Tenemos una televisión y una pequeña cantidad de DVD. Además, no tenemos aire acondicionado, pero sí tenemos ventiladores. Il est important que vous compreniez que Casa Clara n'a pas de chaînes de télévision. Nous avons une télévision et une petite quantité de DVD. De plus, nous n'avons pas de climatisation, mais nous avons des ventilateurs.